WE WERE reminded once again yesterday, in what Bill Davis said and in what he didn't say, that the Eagles are kind of easing into this whole Marcus Smith thing. Fans might be underwhelmed by the news that Smith yesterday worked with the second defensive unit, after running with the third-stringers much of the spring. Progress, yes, but Smith was the team's first-round draft choice, 26th overall, just a few months back. 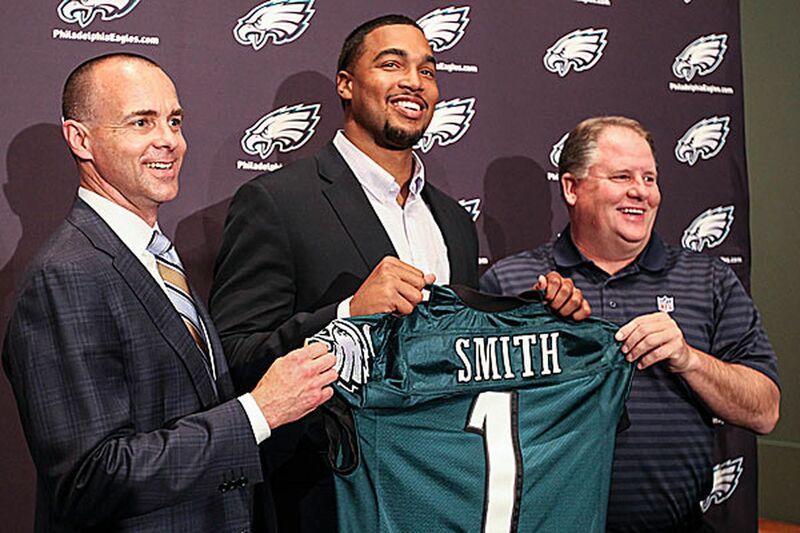 The organization made it clear when he was drafted that Smith wasn't expected to step into a starting role as a rookie, the way Lane Johnson (2013), Fletcher Cox (2012) and even Danny Watkins (2011) were. Draft night, Chip Kelly told reporters the Eagles had gone into the first round with six players targeted at 22 - their original draft slot - but none of those guys had lasted that long. The explanation did not come off as a glowing endorsement of Smith, a quick but raw 6-3, 251-pound edge rusher out of Louisville. The Birds might have done Smith a favor had they switched him with second-round wideout Jordan Matthews, who was taken 42nd overall but figures to fill Jason Avant's old slot role as a rookie. Davis did nothing to raise the bar when asked yesterday about his expectations for the top pick, now that training camp has arrived. "Like all the rookies I've had my whole career, they come at their own pace. We give them every opportunity, to teach and grow them. Every rookie is different," the defensive coordinator said. "Once they get into the building, it doesn't matter the pecking order of the draft, or [if a player was] undrafted . . . they are here, they are young, they have got to learn how to play in the NFL, they have got to learn to practice in the NFL, they have got to pick up our systems, which are much more complicated than [what] they ran in college. "It's on every individual rookie to grow at their own pace. We have an open mind on all of them. We hope they grow very fast, but time will tell." Not exactly, "you'll want to keep your eyes on this guy," or "our edge-rush issues are over." "I'm still learning the game," said Smith, who was a quarterback through high school. "Even though I'm athletic and I can play it, they're teaching me the game a lot more than in college." Asked what impresses him about Smith, Davis said: "Marcus is a very hard worker and a very intelligent guy. Very athletic. He cares a lot about the game and has picked it up very quick." Davis explained that Louisville coach Charlie Strong, who since has moved to Texas, runs a scheme very similar to the Eagles', which made evaluating Smith on film much easier. "So he comes to us not as a 4-3 end in college that we're converting to outside linebacker, he's coming to us as a 3-4 outside 'backer. The only downside is that he doesn't have a lot of experience on the defensive side of the ball," Davis said. "So we see potential for growth." Smith said the scheme indeed is similar, but the terminology is different, and Louisville's offense didn't run at the Kelly pace, so practice is not at all the same. "We really run fast. Just can't get fatigued . . . a lot of times out there, I'm pretty tired," Smith said. "I just got to get ramped up with all the veterans, so I can be out there playing . . . I just need to show them that I'm ready and I know everything that's going on." Smith said he didn't emulate any pass rushers growing up in Columbus, Ga., because, "I played quarterback," but "now, when I look back and I try to look at people, I look at Dwight Freeney, Clay Matthews, people like that, because they go all the time. When they rush, they're nonstop . . . they don't get tired. I want to get to like that, when I'm not tired." He might get tired but he said he doesn't get swamped - isn't confused or hesitant out there, feels he knows what he's doing. "Maybe when I first got here; it was a lot of stuff," Smith said, when asked about being overwhelmed. "But now that we're in camp and I've had a few months to think about it and be able to read the playbook, I don't feel overwhelmed. I feel a lot more comfortable; those first couple weeks, I felt it was just ongoing, and I couldn't get it down." We still don't know exactly what it means that Smith continues to practice on Connor Barwin's side, the "jack," where the role last season was mainly run-stopping and pass coverage, than on Trent Cole's side, the "predator," where you might expect a touted edge rusher to line up. Previously, Davis and Kelly have said that is mainly because 2010 first-rounder Brandon Graham is already penciled in behind Cole. But the Eagles have tried to trade Graham, without success. When Smith was drafted, it seemed clear it was to rush the passer, with an eye toward the fact that Cole turns 32 in October. Whatever happens with Graham and Cole, Davis more than hinted yesterday that the roles and patterns the Eagles established last season won't be exactly the same this year, given personnel tweaks and an increasing comfort level with the system. Can you really develop a rookie, though, if he isn't practicing with and against starters? The Eagles say that's one of the strengths of Kelly's fast-paced practices. "Our seconds and thirds get almost twice as many reps as guys on other teams I've been with," Davis said. "We have more reps per period and we have more reps per practice, so the twos and the threes get more of those. And what this kid really needs is reps - a big volume of reps every day. Getting his eyes in the right spot, his feet, his technique."